This is a homemade nature craft that costs very little to make; just collect the pine cones in fall, allow them to dry out, then dip in melted wax recycled from old candles or crayons. If you like this nature craft, you may also like to see Paper Cup Fire Starters which combine recycled wax with lint or sawdust in paper muffin cups. 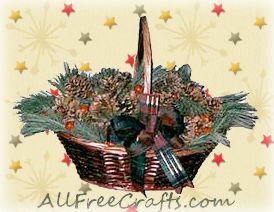 A fabulous way to treat pine cones. Colours vary depending on the treatment applied. Melt wax in double boiler , not directly on stove as heated wax can ignite. Dip pine cones in wax to coat and then dip in a mixture of sawdust and one of the above items, (depending on the burning colour desired). These make fabulous gifts when displayed in a wicker basket, nestled in autumn leaves or Christmas greenery, and embellished with seasonal ribbon bows.